This is one AWESOME stun gun for under $12. - Now with even more power! This compact size stun gun has been one of our best-selling models. For those that don't need all the advantages that Streetwise brand offers this lower priced generic model could be a great self defense option. Its compact and very, very powerful. 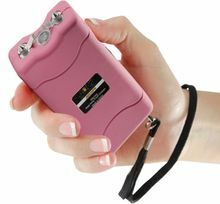 Powerful Stun Gun: Just test firing a jolt of this unit in the air is often enough to stop an attacker. As the bright electric current pulsates across the top of the unit it creates an intimidating electrical sound. ZAAAP!!!! An attacker with any sense will be stopped in his tracks. If the sight and sound does not stop him, a "jolt from the Jolt" certainly will. Built-In Charger: The slide-out plug on this unit allows for easy charging. There are no cords to keep up with; simply plug into a standard wall outlet. (No pesky parts to lose). Bright LED Flashlight: The LED flashlight provides a convenient source of light whenever you need it and eliminates the need to carry a heavy, bulky flashlight. The LED will never burn out (at least for 17 years) or shatter like ordinary bulbs. Safety Switch: To prevent accidental discharge, three levels of safety have been built in. The safety pin must be inserted, the safety switch must be in the on position and the Stun Activation Button must be pressed before the stun gun will discharge its output. Rubberized Armor Coating: Protects the unit and ensures a firm grip. It feels solid in your hand. Holster Included: A nylon holster with belt loop is included for easy carrying, keep it clean and protect it from scuffs. We do not ship stun guns or tasers to DC, NY, IN, HI, MA, MI, NJ, RI or outside the USA. Also we cannot ship stun guns to Chicago, IL., Annapolis, MD.,Howard county, MD.,Denison, IA.,D.C. and Philadelphia, PA.